The circus that has been the Greek financial crisis over the past five years reached a new crescendo over the last few weeks with all the mystery of a Shakespearean tragedy. Leftist Greek Prime Minister Alexis Tsipras played the role of populist defender of the needy by standing up to those bullies in suites from all those pompous European nations trying to extort austerity from the Greek people. In defiance he defaulted on the first round of IMF loans and called for a referendum. When the Greek people voted over 60 percent in favor of rejecting the onerous terms Tsopras went to the European parliament and gave a defiant speech in favor of giving money to the people not the evil bankers. Then, after reality slapped him in the face with all the subtly of a wet tuna, he promptly folded like a cheap suit on a humid day. Of this outcome there was little doubt. 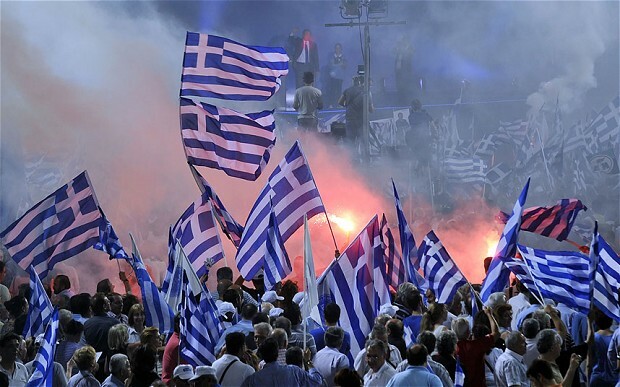 Greece’s entire banking system was about to implode, the savings of every Greek were about to disappear. The world was about to see a first world nation, all be it only barley, turn into a third world disaster live on CNN. While the intricacies of the Greek Crisis will be filling the pages of Economic Journals for years to come, the problem is remarkably simple. When you spend more than you make you go to others to borrow money. When you borrow more than you ever hope to repay, your creditors run the show. This is as it is in every household’s finances and thus it is with nations as well. If financial debt had physical weight, Greece would be down at the bottom of the Aegean along with the lost city of Atlantis. With a debt exceeding two times GDP and with five years of IMF/EU enforced austerity under its belt with little to show, Greece is an economic corpse. This article is not focused on how Greece ended up where it is, but the reality is national overspending comes to an end when the banks run dry. Simple. Now this is nothing new, the economics of South America in the 20th century is littered with failed economic turn around and booms gone bust. The drama played out repeatedly with similar script each time. A “new” regime took over in a nation and turned around the sick economy they inherited. Happy days were there again! Foreign banks rushed in and willingly funded deficit spending that fueled a boom akin to a sugar high. Then, at the first sign of real trouble the bubble burst. However the South Americans (and yes, not all South American countries experienced this or followed the outcome below, but enough did, you know) with all their experience with the blue suits from the IMF, ever end up where Greece finds itself. That is because when their government felt the domestic pain of austerity was exceeding that of the foreign banks, they simply devalued their currency. As sovereign debt is almost always denominated in the home currency, if a country owed let’s say 100 billion pesos and it did a 3 for 1 devaluation, the total money supply would increase by 3 times (economists reading this please excuse my simplicity, this is for illustration) but the debt would remain the same. Sure devaluation is painful, but not as painful as cutting pensions in half and may prevent you from being overthrown like the last government (but not likely!). The foreign banks likely take a hosing, but they will soon forget and with the promise of a “new” economic miracle will be back lending to you in a few years. After several decades of this the 21st century has seen several of the South American problem economies seem to actually achieve a free market renaissance. But Greece no longer has the Drachma and monetary policy is now controlled by the Blue Suites (well tailored, very nice) from the EU. After decades of irresponsible fiscal policy and a national economy which has seen a significant decline in its base economic generating ability, the Greek government has about as much influence as the homeless man begging outside trump Tower. Yet what makes this story truly Shakespearian is that the new “loans”, almost 100 billion Euro worth, will never be repaid. Take a person who maxes out their credit cards, more debt to pay the existing debt never solves the problem; it just kicks it down the road. The Greeks want debt forgiveness (sorry they call it restructuring) but the fiscally disciplined German voters, and to a lesser extent French, would never stand for it if their leaders simply gave their cash to those Greek spendaholics. So for the sake of the phony Euro, the game goes on yet sadly nothing is resolved. Now all this would be an amusing economics lesson if it were not for the potential consequences. While world markets largely factored in a Greek default and thus did not really react to the events of the past week, the stakes have simply risen for an eventual uncontrolled collapse. Additionally, if you think this is a uniquely Greek problem, think again. Europe has Portugal, Spain and potentially even Italy lined up to face similar situations. While each is unique and those economies have better underlying fundamentals than Greece, they are also of increasing magnitude and with the resources (and generosity) of the EU increasingly strained, the potential for significant global economic consequences are very real. Not my problem you say? A default of a major Euro member (say Spain or Italy) would dwarf the financial losses that triggered the 2008 economic crisis. “Tax the Banks” and “Let em Fail” make for cute slogans, but when your money vanishes and stock markets melt down the pain would be widely felt. Here is why the Euro is not only an economic folly but potentially a dangerous accelerant. Macroeconomics 101 defines that nations have two tools to manage their economies, Fiscal Policy and Monetary Policy. The EU however takes away the handle of monetary policy from a National Government and hands it over to the unelected bureaucrats of the EU. Fine individuals all, they simply have too big and diverse a group of national economies to deal with no shared fiscal policy. Quite simply and regardless of your philosophical approach, monetary and fiscal policy have to work in a coordinated manner; in the EU that simply cannot happen. When the fiscally responsible nations have to continually bail out the spend happy, politics will kick in and the hand outs will stop. National self determination is the right of all nations but each must accept the consequences of their own actions. The Euro simply cannot long exist within that reality. Greece would be far better off with a controlled exit from the EU and abandoning the Euro. Let’s be clear, Greece has made its bed and things are going to become less comfortable before they improve. However a realization that Greeks should control the future of Greece makes global economic sense and faces political reality. Today the wisdom of Margaret Thatcher in keeping the UK out of the Euro zone seems increasingly bright. I wonder if the Germans could have the Deutsche Mark back how their people would decide.